Employees share in company ownership. Continual improvement shows we care! 40 presses ranging from 32 to 500 tons are standing ready to meet your short, intermediate or large volume needs. Welcome to our website! Genco is proud to be your one-stop resource for a full range of metal stamping and manufacturing solutions. From our modern facilities in Cookeville, Tennessee, we are pleased to engineer and produce tools, dies, parts, components, assemblies -- you name it -- for the ride control, appliance, heating and other industries. What can we produce for you? No job too large...or small! Everybody wants your big orders. But...what about the small runs? Aren’t you tired of having to practically beg your current supplier to produce your small runs and service quantities? Genco Stamping & Manufacturing Company -- Your Short Run Specialist! Sure, we want your big orders and have state-of-the-art progressive dies to produce millions for you! The point we’re making here, however, is that we’re capitalized to put our pedal to the metal on your small to intermediate quantities as well. So...bring them on! Our manual production lines are at your service! SolidWorks 3D design software allows Genco to design better products faster. SolidWorks includes translators that support DWG, DXF™, Pro/ENGINEER®, IPT (Autodesk Inventor®), Mechanical Desktop®, Unigraphics®, PAR (Solid Edge®), CADKEY®, IGES, STEP, Parasolid, SAT (ACIS), VDA-FS, VRML, STL, TIFF, JPG, Adobe® Illustrator®, Rhinocerous®, IDF, and HSF (Hoops) formats. 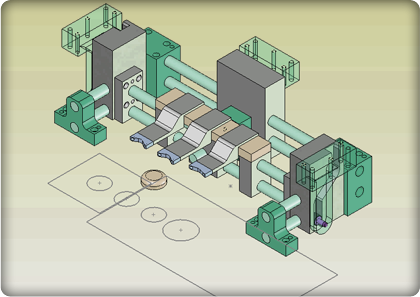 Visit www.solidworks.com to view a demo.